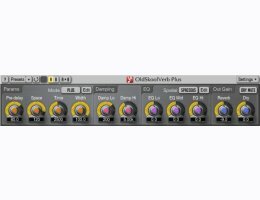 OldSkoolVerb Plus is an algorithmic reverberation plug-in for professional music production applications. This plug-in is an extended version of freeware OldSkoolVerb plug-in. This plug-in implements a kind of “classic” stereo reverb algorithm which is technically simple yet optimal. It produces a very clear spatial image that blends well with the mix. OldSkoolVerb Plus offers you a comprehensive set of parameters permitting you to achieve various reverbs ranging from plate reverb to room reverb to hall reverb sound. OldSkoolVerb Plus is suited all kinds of sounds, both percussive, hard-attack sounds like drums and picked guitars, and soft-attack sounds like vocals, piano and pad sounds. In comparison to freeware OldSkoolVerb plug-in, the Plus version features an additional spatialization module which provides additional control over reverb’s spatial image and greatly increases reverb’s density.